I was sitting at Extreme Trampoline trying to update my never ending calendar while my kids soaked in their last moments of summer. My 5 year old ran off by himself and headed for his favorite section in the giant warehouse. 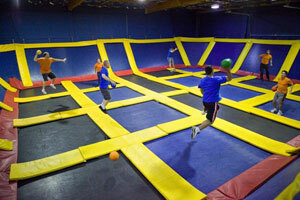 The dodgeball court. If you've read any of my previous posts, you know he's not the most athletic of children, but doesn't seem to care and is just thrilled with life. Because he's very non-confrontational, and not particularly sporty, I'm amazed that dodgeball is the section he's obsessed with. I was watching from afar when a large group of campers came in, all identified by their baby blue t-shirts. Wouldn't you know it a group of older, overzealous boys headed right for the same court that my son was gleefully bouncing around. They grabbed balls immediately and started pelting my sweet baby. I know that's the object in dodgeball, but these kids were on the same side as he was - essentially bombarding their own teammate. A couple of times he was hit with a force that knocked him completely off his feet. It took every ounce of my being to not run over there and tell them to stop. I watched him take a rubber ball beating for about 5 minutes when I was about to get up and at least send his older sisters in there for reinforcement. But then the most amazing thing started happening. He began to bound into the air, using the tramps angled on the walls as leverage to navigate countless near misses. He darted in and out of them like he was Rue from the Hunger Games. He hopped over one attacker that was bending over picking up more ammunition and dodged the next by climbing up the wall Spiderman style. The older boys started getting so aggravated that they couldn't hit him, that they gave up and took aim at the kids on the other half of the trampolines. My eyes started welling up with pride. Because he's so sweet, sensitive and passive, I worry about him in a testosterone filled world. I was even proud of myself for letting him figure out a solution to this seemingly impossible situation. He had to know he couldn't compete with them in hand-to-hand combat so instead, he came up with a better solution on his own. It's taken me 5 kids, but I think I've finally figured out that I need to let them fall more often and not to come riding in on my white horse to save the day. A few years ago, I would have marched over there, picked up some stray balls and hurled them at the pint-sized bullies. I'm hoping this means I'm maturing and getting a little better at this parenting thing. When it was all over and he was safely back in the car guzzling water, I said to him, "You know those were pretty big boys you were in a battle with at dodgeball. I didn't really like all them hitting you." He said, "It was just fine. They weren't hitting me, they were missing me!"